Derailleur snapped off, chain broken and holding wheel onto frame. My chain slipped a couple times, and then rear wheel locked and the bike stopped. Things were under enough control that I was even able to make a “I am stopping” hand signal so the car behind me wouldn’t run me over. I got off the road and discovered the situation above. 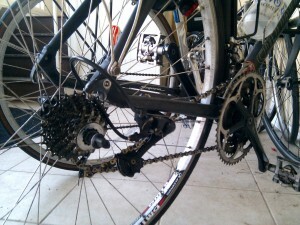 The rear dropout basically snapped off, so the derailleur jumped around and got caught. The chain broke, but didn’t actually come apart. The whole system was actually stable, so that the rear wheel didn’t just fall off. Because the rear wheel was locked, I had to carry my bike to central square (1 mile), get on the T, and then carry the bike home (.6 miles). On the plus side, my arms are pumped now! And on the double-plus side, I guess I simply must buy a new frame.